Around 1970, feminism (“the radical notion that women are people” —Marie Shear) began inspiring many women to realize that if they loved science fiction, they could write it too. So they did, and became published writers of science fiction in significant numbers. The thing that impressed me about this trend was not just that editors actually bought their work, but that they published it with a woman’s name on it. I felt that science fiction was actually living up to its reputation, sociopolitically as well as technologically—embracing change and acknowledging the movement toward greater equality between the sexes at a much faster rate than society in general. Women science fiction writers had seemingly been welcomed into the newly diverse field by a majority of readers. 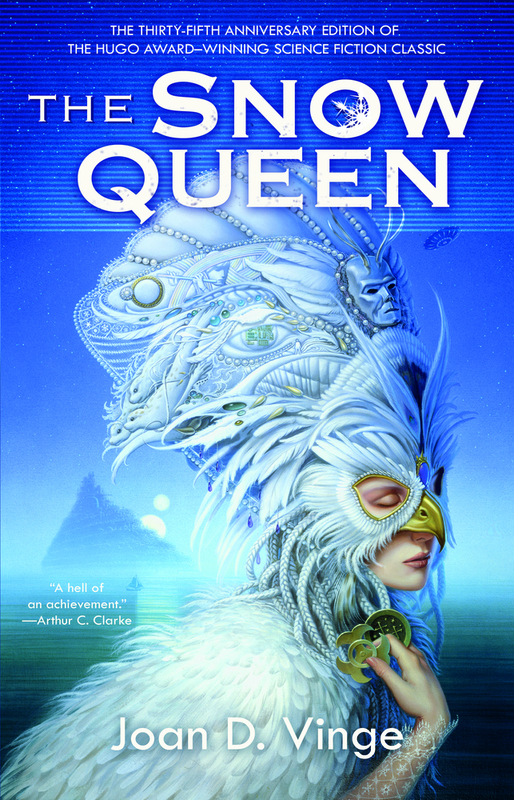 By then, I had basically finished writing The Snow Queen, a novel in which I set out specifically to explore as wide a variety of female characters as I could (while neither ignoring male characters nor demonizing them). I did this because at the time there were still relatively few science fiction novels with even one female protagonist. The Snow Queen went on to give me some of the peak moments of my life: it got a rare quote from Arthur C. Clarke praising it, [the first edition] had a cover painting by Leo and Diane Dillon, an award-winning husband-and-wife team who were among my all-time favorite artists, and it won the Hugo Award for Best Novel in 1981. Most of the science and technology that could make the future history of The Snow Queen a reality were still over the horizon when I wrote it. Some of the science was even considered impossible by researchers. Since then, however, advances in—for example—quantum physics have brought the existence of parallel dimensions and faster-than-light travel into the realm of serious science; advances in biology and computer technology have moved things like cloning and nanotechnology into public discourse. On the other hand, the plot of The Snow Queen concerns ecological issues like climate change and the impact of population growth, as well as the threat of extinction faced by endangered species. It also deals with the kind of politics that inevitably lead to the technological-and-financial haves exploiting the have nots; with foreigners stripping a world of valuable resources, aided by the corrupt government of the exploited world; with strained relationships and tense interactions centered on equal rights, and conflict among people from various cultures who find each others’ values completely alien. When I wrote about those issues in The Snow Queen, in the latter half of the 1970s, they were contemporary concerns that had emerged from “The Sixties,” an era of sociopolitical upheaval which reached a peak in the protest and eventual public repudiation of the Vietnam War, which was at its height from about 1965 to 1973. It’s both gratifying (from a literary standpoint) and disheartening (from a social one) that thirty-five years after I wrote about issues that are as much social science as hard science, they’re still as relevant as they were then. I hope that readers of The Snow Queen will do a little “compare and contrast,” not just between the present day and the novel, but also between the present day and the last half century. In the meantime, I’m glad that science fiction—especially science fiction by women, and even a novel written over three decades ago—still has something to teach us about the present and the future. Visit Joan D. Vinge on her website. This is one of the best books I have ever read. I HIGHLY recommend it. You might want to let Amazon know that there is something screwy about the Amazon listing for “The Snow Queen” — if you try to click on the Kindle edition, it takes you to a book with the same title by a different author, about reading to your kids in Russian. I saw that “The Summer Queen” and “Tangled Up In Blue” were available now — any word about “World’s End”? Loved these books when I read them the first time, so I’m looking forward to having them easily accessible to introduce the series to friends! I remember being 15 years old the first time I read this and it was the first time I ever identified with a female protagonist. It remains one of the most profoundly human and life affirming works in the genre or any other genre, as well as one of the best retellings of a classic fairytale.